This was actually one of the most interesting and somewhat strange tales in the history of computing. The rise and fall of the Apple Lisa coincided with numerous other events and concluded with the ousting of Jobs at Apple by John Sculley a man who he lured to the company by showing him the Lisa just before it was rolled out to the public in January 1983. The roots of the Apple Lisa were at Xerox Parc (Palo Alto Research Center) and an historic machine called the Alto whose technology became the Xerox Star which was first shown at the May 1991, National Computer Conference. Costing between $15,000-$50,000 for a system the Star was not for the casual desktop computer user. The Lisa was hoped to be, but its price of $10,000 would prove to be too expensive for the market Apple had developed. When the Lisa was announced so was the Apple IIe. The latter kept the company afloat as the Lisa tanked. The Lisa officially stood for Logical Integrated Software Architecture. Everyone in the industry at the time knew it was monikered after a girl named Lisa (rumored to be a secret daughter of Steve Jobs) and the rest was reverse engineered to fit the letters. The original machine consisted of a 5 MHz 68000 (.4 MIPS) with 1 MB RAM, 2MB ROM, 720×364 graphics running on a built-in 12-inch monitor. There were two built-in floppy disk drives that Apple manufactured itself and which were proprietary. These drives, called “twiggy” drives used an odd 5 1/4-inch disk with unusual holes. Using a two sided two head design the disks could hold 860 KB. It always mystified people that Apple chose to design this oddball drive. It had unusual characteristics such as variable speed and non-opposing r/w heads on opposite sides of the disk. A pad would be on the other side of the head rather than another head. Originally it was thought that these miracle drives would be incorporated into the Apple II line. They never were. They turned out to be unreliable. Since Apple co-founder Steve Wozniak was noted for his unusual and creative disk drive design used by the Apple II, I have always suspected that Jobs, wanting to one-up Woz, kept trying to do something creative with disk drives. Another drive Apple did under his watch was the Widget — a 10 MB hard disk. In the NeXt machine he incorporated an offbeat optical drive. When he rolled out the first iMAC he finally rebuked the disk drive and has nothing! The Lisa was the first GUI machine designed for the mass market. Although not priced low enough it did introduce all the features that are common in all popular machines today including the mouse and desktop metaphor. Historically it is one of the most important contributions to computing and the original Lisa 1 is a serious collector’s item. It still has features that we have yet to see incorporated in modern machines including a true “instant on” capability and internal serial numbers built into the hardware. By January of 1984 as the Macintosh was about to be introduced the company gave Lisa 1 owners a free upgrade to the Lisa 2 and announced the Lisa 2/5 and Lisa 2/10. The “5” had a five megabyte hard disk and the “10” a whopping 10 megabyte hard disk (the Widget). The Twiggy drive was dropped for a 3 1/2-inch Sony. Still few sold. 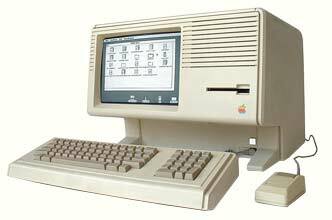 It was estimated that Apple, beginning development in 1979, spent $50 million on the Lisa. Luckily much of the development could be rolled into the Macintosh. One year later the company changed the name of the Lisa to the Macintosh XL (meaning extra large) hoping to squeeze some extra sales from the machine. The software was changed to make the machine Mac compatible and a Mac format 3 1/2-inch drive was incorporated. By April, 1985, the same month that IBM dropped the PCjr, the Lisa was dropped from the product line. The next month Jobs was ousted as head of the Mac division and then resigned from the company. In June he was “banished” from the company. 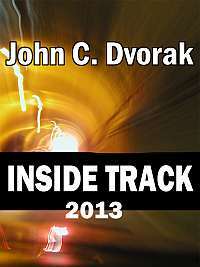 Dvorak writes a cruel Inside Track column, then published in Infoworld, saying “Good Riddance.” Jobs has never spoken to him since. Jobs then went off and formed NeXt computer which, a decade later, was brought back into Apple along with Jobs who now rules the roost there as CEO. What a strange route to the top. It’s claimed that Apple manufactured 100,000 Lisas. Sales figures are hard to come by. In 1989 Apple dumped thousands of Lisa machines in a nearby landfill where archaeologists will unearth them someday and create mystical stories about the machines. Bad Behavior has blocked 13627 access attempts in the last 7 days.